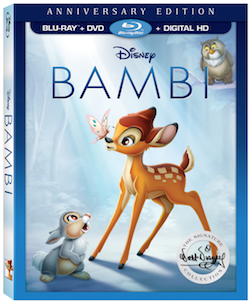 Bambi Joins the Walt Disney Signature Collection on DVD! Disney fans!! Disney’s Bambi, which celebrates its 75th anniversary this year, joins the Walt Disney Signature Collection by arriving on Blu-ray™, DVD and On-Demand tomorrow, June 6th. The Collection release includes a variety of new bonus material, including recordings of Walt Disney discussing the challenges and triumphs during the production of “Bambi;” deleted scenes and characters; stories and effects that “Bambi” had on the Studio, other films and artists; and much, much more. Additionally, the Digital HD release includes an exclusive, heartfelt feature on the incredible artist, Tyrus Wong, who inspired the film’s soft watercolor backgrounds and beautiful palette. I love the bonus features on these special DVDs and I think they are a wonderful way to share the rich and amazing Disney history with your family. What I love about this movie is that it’s really for everyone, truly a movie that the entire family can enjoy together. I love telling my kiddos that this was the very first movie that I remember seeing at a theater. That makes it seem extra vintage and mind blowing!